This sweet, romantic dress has a bit of a nostalgic prairie-girl vibe we adore. 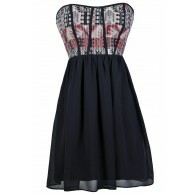 The Amelie Crochet Lace Trim Black and Ivory Dress is made of a cotton blend fabric. 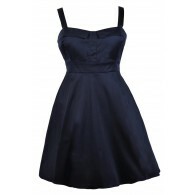 It has a rounded neckline, elasticized empire waist, and classic A-line skirt. The best part of this dress has to be the black crochet lace that trims the bodice and hemline, creating contrast in an ethereal way. A black fabric sash wraps around the waist, completing this dress. We love the subtle antique feel of this dress. It looks like it could have been worn 50 years ago--and it will still look stunning 50 years from now as well. Try pairing this dress with black pumps, wedges, or heels and delicate black jewelry. 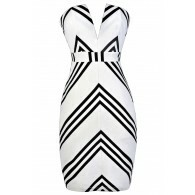 Another option is to wear this dress casually with black flat sandals and an oversized bag. This is a great dress to pack on vacation or to wear to any summer event. You could even try pairing it with black tights as the weather gets colder. Details: Fully lined. 75% cotton, 25% polyester. Lining: 100% polyester. Hand wash cold water separately. Color will bleed. No bleach. Hang to dry. Small measurements: Length from top of shoulder to hemline: 36". Bust: 34". 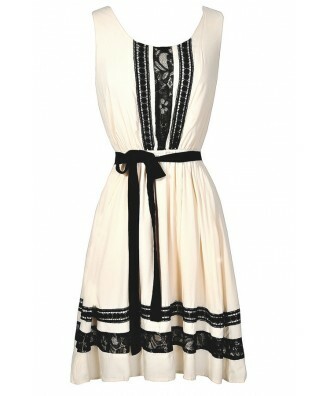 You have added Amelie Crochet Lace Trim Black and Ivory Dress into Wishlist. You have added Amelie Crochet Lace Trim Black and Ivory Dress for Stock Notification. 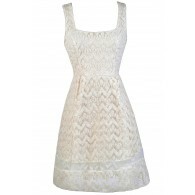 You have set Amelie Crochet Lace Trim Black and Ivory Dress as a loved product. You have removed Amelie Crochet Lace Trim Black and Ivory Dress as a loved product.